The canary yellow dress worn by the MP at the State of the Nation Address last week set tongues wagging but the MP is holding her head up high despite insults from all avenues. She was called Oros man, a caterpillar, a Teletubby, a whale, a walking lemon and even an oval egg but Thandile Sunduza has vowed to hold her head up high. The canary yellow dress worn by the MP at the State of the Nation Address last week set tongues wagging as social media was abuzz with people insulting her. Sunduza, who is also 7-months pregnant, blames her designer for how her dress turned out. Taking to Facebook, Sunduza wrote: “I am 7 months pregnant, it’s not a secret... Oh thanks to the designer who let me down last minute. The dress was torn, cloth falling, had to cut in the office. It was a disaster! A pregnant woman can't just walk into a shop and buy a new dress,” she wrote. 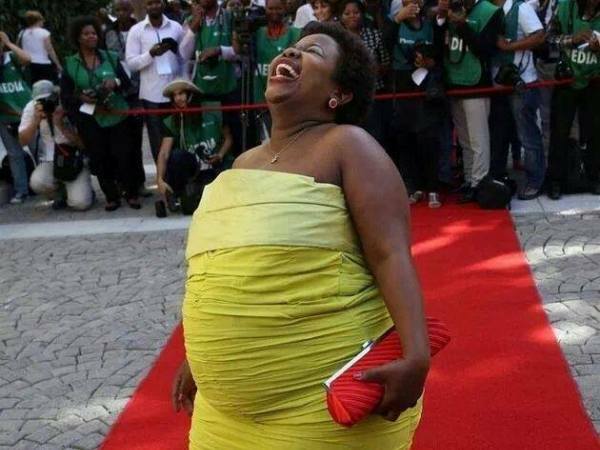 And a day after the SONA, Sunduza was admitted to Park Lane Clinic in Parktown, Johannesburg after her blood reached dangerously low levels but she insists the humiliation she suffered due to her dress had nothing to do with it. In an act of defiance, she has changed her Facebook profile picture to one of herself in the dreaded yellow dress.